Music by Ivan Sokolov and Alexander Glazounov. 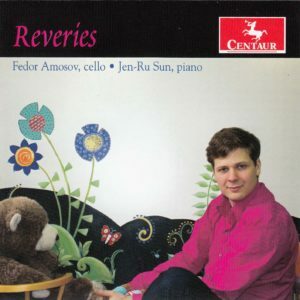 Six Sonatas for cello and Basso Continuo arranged for cello and piano by Fedor Amosov. Iean BalthasarTlicklir (1750-1813) is a curious borderline composer between Baroque and Classical styles. He was born in Dijon, France and was of German descent. He moved to Mannheim, Mainz, and finally Dresden, making a fine reputation as a cellist and composer, writing 16 cello concertos, three violin sonatas, and the present six for cello and basso continuo. The sonatas are in three movements and give a very pleasant impression. Amosov has removed the basso continuo Iine, substituting a busy piano part. The result is convincing to the ears but alters the character of the music to the point of no return. If he had at least included the original basso continuo notes and the rhythmic figures that play off against the cello line (I think the copy I have of the earliest publication) I would be more inclined to accept this recording as doing justice to the composer. 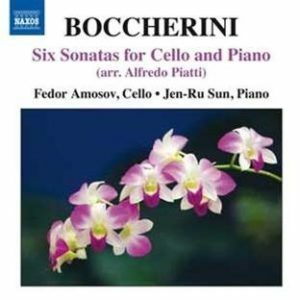 As it is, Amosov plays the cello part with great accuracy and enthusiasm, but the piano part is almost entirely his own invention. I suspect that Tricklir would be shocked by the prevalence and virtuosity of the Piano Part. The liner notes include an extensive excerpt from my review of Amosov’s previous recording of Six Sonatas, Op. 12 by Jean-Baptiste Breval (Centaur 3195, Jan/Feb 2013). If I had had the sheet music for those sonatas (also arranged with piano from a basso continuo line by Amosov) I might not have been quite as enthusiastic about that issue as I was. However that may be, the fact remains that these are enjoyable works as well, arranged as they are. Amosov plays with his customary enthusiasm, as does Kostritsa. Taken for wha it is, it is a highly enjoyable recording. You’ll need to arm yourself with a few salient facts if you come fresh to this Centaur release. Not only is there no reference to Jean-Baptiste Bréval’s dates of birth or death, there is also no reference to the year of publication of his six sonatas, Op.12. In fact there’s hardly anything at all, except a brief, exuberant comment from cellist Fedor Amosov as to why he likes these works so much, and then two large biographies of both him and pianist Alexey Kurbatov. I don’t normally carp on about such things, feeling the music is more important, but here the sonatas are pretty obscure, indeed not well known even to admirers of the composer, for whom the quartets, cello concertos and symphonies concertantes are by far the most rewarding parts of his work list. So it’s that much more important to help out the prospective purchaser. That point duly noted, it surely wouldn’t have hurt Centaur to reprint a few details of the composer’s life. So the critic will have to do it instead. Cello soloist and orchestral player, he made his solo debut in Paris in 1778. He flourished as a composer between 1775 and 1805 – the sonatas were published in 1783 – and gave up performance in around 1814, to concentrate more on administration. For cellists the concertos are important but so too is his Traité du violoncello, Op.42, an instructional treatise of 1804 that remained influential. The six sonatas were written for cello or violin and basso continuo. Amosov isn’t the first to arrange them, or some of them, for cello and piano; he spurned the opportunity to do so for harpsichord, for reasons which I find sympathetic: he decided they simply worked better with piano. The recording is quite dry and close and catches the cellist’s frequent sniffs. If you are allergic to this aural phenomenon, you might have to tame your controls. Otherwise the balance between the two instruments is reasonable and the playing largely persuasive, though subject to some frailty when the cello passagework proves too onerous. Of the music, it’s easiest to say that it travels from the Baroque to the early Classical throughout the extent of these sonatas. Melodically the writing is charming, and lyrically things fall easily on the ear. Nothing outstays its welcome – indeed few movements last longer than four minutes – only one, in fact. Rhythms are buoyant, each three-movement sonata works well; dance movements such as Sicilianas and Minuets move forward at natural-sounding tempo. Except in the long Allegro of No.6, Amosov proves a willing guide to the works he has arranged. He clearly revels in the harmonically straightforward but lyrically ingratiating opportunities afforded him by Bréval, and Kurbatov keeps him necessarily discreet but effective company. In short, and despite the imperfections already noted, much here is brief, but often delightfully so. 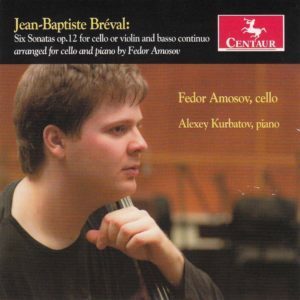 Jean-Baptiste Breval (1753-1823) was a Paris cello virtuoso and a prolific composer in various genres. His name is familiar to me, so I was amazed. to discover that I have only two pieces by him, cello sonatas, one from this opus played by Daniel Shafran and one in C played by Simca Heled. On looking him up in the ARG index I don’t find him at all. I finally found more of him in my collection of sheet music xeroxed in the Paris Conservatoire library many years ago. Amosov has done us a service in recording these attractive pieces. He tells us that they were written originally with basso continuo lines, and he has arranged them for piano. They are thoroughly convincing this way. They should be, since they were written in the middle of the classical era when the piano was in and the harpsichord was fast disappearing. They are virtuoso pieces in three movements with a good deal of variety and make very pleasant listening, especially handled with the kind of effortless brilliance shown by Amosov. As a Russian cellist, he doesn’t go for the non vibrato technique but he is obviously having such fun that he disarms criticism from the early-music standpoint. These sonatas are also written for violin. There’s actually a lot more Breval waiting for our attention. I’m glad to start here. My sheet music collection contains six duos for two cellos. Come on over, Mr. Amosov! Album of Music by Russian and European composers. Six Sonatas for cello and Basso Continuo arranged for cello and piano by Alfredo Piatti. 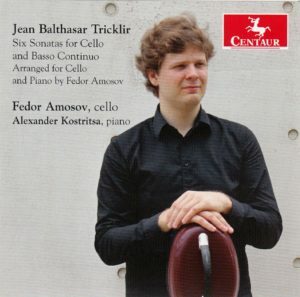 Amosov is a young Moscow cellist who plays with generally good taste and virtuosity. His interpretations are smooth and musically phrased in a low-keyed but exciting way. …these are effective performances. The days of Crystal Palace Messiahs and monster orchestras playing the Brandenburgs have long since gone, and an historically informed approach is expected of present day performers. Sometimes there seems even to be an element of competition as to who can produce the most outlandish performance based on previously unused evidence or theories. The present disc has gone in quite the opposite direction, and presents these Sonatas in the edition produced by the Italian cello virtuoso Alfredo Piatti (1822–1901) in the 1870s—in other words, the form in which they used most commonly to be heard until relatively recently. I started listening fully expecting to disapprove, but almost immediately I was won over by the sheer musicianship of both the arrangements and the performances. The Sonatas were originally published for cello and bass continuo. They have been recorded in that form using a variety of instruments—Naxos has an excellent version of some of them using fortepiano as continuo instrument—but always the two lines of the original published version are clearly audible as the basis of the performance. Piatti however did not stop at adding chords and occasional imitative lines to Boccherini’s bass. Certainly the published bass part is there, albeit sometimes in different octaves, with elaborations and sometimes simplification of the original, but in addition there is a whole host of imitations using the whole compass of the piano. The result is that whilst the cello remains dominant the two instruments are much more equal partners. In lesser hands this could have been a disaster, and indeed there are plenty of examples of nineteenth century editions of baroque and classical works which wholly change the character of the work, thickening the texture and obscuring the simpler lines of the original. That is not the case here. Piatti was certainly generous as well as extremely imaginative in what he gives the pianist to do, and he adds yet further difficulties to an already difficult cello part full of double stops and very high passages. This could sound hectic or over-busy, but as played here it is pure delight from beginning to end. Given that Piatti was encouraged by such composers as Liszt, Mendelssohn and Sullivan this should perhaps be no great surprise. I had not heard of Fedor Amosov before. He studied with an array of fellow-Russian cellists, including Rostropovich, and has won several competitions. He plays with great panache, delicacy when that is called for, and has an enviable range of tone colours. Above all he is responsive to the sheer charm and melodious qualities of the music. The Taiwanese pianist Jen-Ru Sun was also previously unknown to me, but I am very pleased to have heard her here playing as an equal partner and making the most of the opportunities that Boccherini—and, even more, Piatti—provides. With a clear recording and good leaflet notes this has been for me an exceptionally and unexpectedly enjoyable disc which I hope will be tried even by those to whom historically informed performance is normally a sine qua non when choosing recordings. Another very old friend here: in 1962, we made the first North American recording of this music, with Belgian ‘cellist Charles Houdret (founder of the Queen Elisabeth Music Competition in Brussels, where David Oistrakh won first prize, ‘way back when). The pianist was Monique Marcil. I’m not sure that we used the Piatti arrangements, because in some spots the music differed from the one we made. Perhaps these are the performers’ own cadenzas. This is great music: lots of variety and styles that give the cellist opportunities to show off. On the whole, Amosov’s tempi are brisk, yet this recording is nearly 8 minutes longer than the old Baroque Records LP (ORION LAN0194). Recorded quality, Intonation and style are flawless, and pianist Jen-Ru Sun is easily up to the challenge. On his death in 1805, Luigi Boccherini left an extensive catalogue of works including 32 sonatas for cello and bass continuo, six later arranged for cello and piano by the Italian cellist, Alfredo Piatti. Born in 1743, and the son of a cellist, he was sent to Rome at the age of 14 to study the instrument and was soon travelling as a soloist. He eventually settled in Madrid working as a composer and a member of the Royal Court. But life from there went slowly downhill, the death of his patron, his first wife, his children and his second wife, left him in a poor mental state, and though he enjoyed a small pension from the King of Spain, he died in some degree of poverty. The six sonatas were published in London in 1771, and as was customary at the time they appeared in many guises, the most popular being one for violin and continuo. Piatti’s is, however, a fundamental shift of texture and needed an element of composition to create a piano part. Though varied by the position of the slow movement, they are all conventional in shape and are quite short. Thematically they aim to please the listener, and at the same time offer challenges to interest a virtuoso cellist, the finale of the Second being a finger-knotting experience. It is played by the young Russian-born Fedor Amosov and the Taiwanese pianist, Jen-Ru Sun. Amosov deals admirably with passages of tricky intonation and produces an elegant singing tone for slow movements. The reverberant American recording much enlarges the volume of the cello’s lower strings, but balance between instruments is good.